Balkcum | Scuffalong: Genealogy. Balkcum – Scuffalong: Genealogy. Ohhh, a thing is brewing with my Aldridge-Balkcums. A couple of days ago I got a message from a woman who administers her uncle’s 23andme account. J. told me that her uncle, M.R., matches me and R.L. on chromosome 20. R.L. is a known cousin who’s descended from Robert and Mary Eliza Balkcum via their daughter Amelia Aldridge Brewington. She and my father (who’s descended from son John W. Aldridge) are third cousins. I was mystified at first, as I didn’t see any other matches to dozen-plus other Aldridge-Balkcums at 23andme. Then, R.L.’s daughter B.J. steered me over to GEDmatch. There, in small doses, M.R. and his son J.R. match (and triangulate with) me; my father; his half-first cousin J.H. ; R.L. ; and A.S., who’s descended from Amanda Aldridge Artis. M.R.’s roots are primarily in Ohio, but he has a few western North Carolina Piedmont and Virginia lines. What in the world is the connection??? The fourth in a series of posts revealing the fallability of records, even “official” ones. 1. Margaret does not appear in the 1850 census under any name. 2. Nancy Balkcum of Sampson County NC lists a daughter Margaret Balkcum in her will. For reasons set forth here, I believe this was my Margaret. 2. No marriage license for Lewis and Margaret Henderson has been found. 3. Son Caswell Henderson‘s marriage license, issued in New York City in 1907, reports his mother’s name as Margaret Balkcum. 4. Margaret’s own 1915 death certificate, issued in Wayne County NC, lists her mother as Margaret Bowkin and her birthplace as Sampson County. Son Lucian Henderson was the informant, and I suspect he gave his own mother’s name in response to a query, rather than his mother’s mother’s. It’s a mistake I’ve seen before. But “Bowkin” is nicely evocative of “Balkcum,” and I believe that’s what he meant. 5. Lucian Henderson died in 1934 in Wayne County NC. His death cert lists his mother as Margaret Hill. Hill??? Johnny Carter was the informant. Johnny was not a blood relative, though his maternal uncle Jesse Jacobs married Lucian’s sister Sarah Henderson. Lucian’s only child died young, and Johnny cared for him in his dotage. He left his estate to Johnny Carter, but I have no reason to believe that Johnny had any certain knowledge of Lucian’s mother’s maiden name. Margaret Henderson is a case in point. One should regard early death certificates with skepticism. They are no stronger — or more accurate — than the informant’s personal knowledge, and the source of the informant’s knowledge was not questioned. The two bits of evidence from Mag’s own sons, Caswell and Lucian, are fairly consistent, but reports originating beyond their generation diverge widely. The death certs of Mag and her children reflect what people thought they knew, or had heard, or maybe even made up, about Mag’s early life. They are useful — but flawed. The case for Margaret Henderson as daughter of Nancy Balkcum. 1. Margaret was born 1833-1836, probably in Sampson County NC. Mary Eliza was born in 1829 in Duplin or Sampson County. 2. 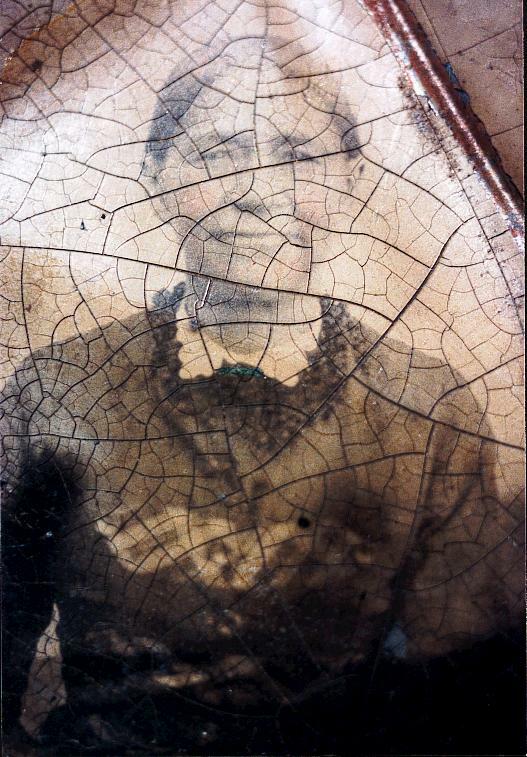 Her photo clearly indicates that she was mixed race, as was Mary Eliza. Mary Eliza Balkcum’s mother Nancy Balkcum was white. 3. Margaret is not listed in the 1850 census, and neither is Nancy Balkcum. 4. Nancy Balkcum’s will makes reference to a daughter Margaret Balkcum, as well as a daughter Eliza Balkcum. The will was probated in 1854 in Sampson County, prior to Margaret Balkcum Henderson’s marriage circa 1855. 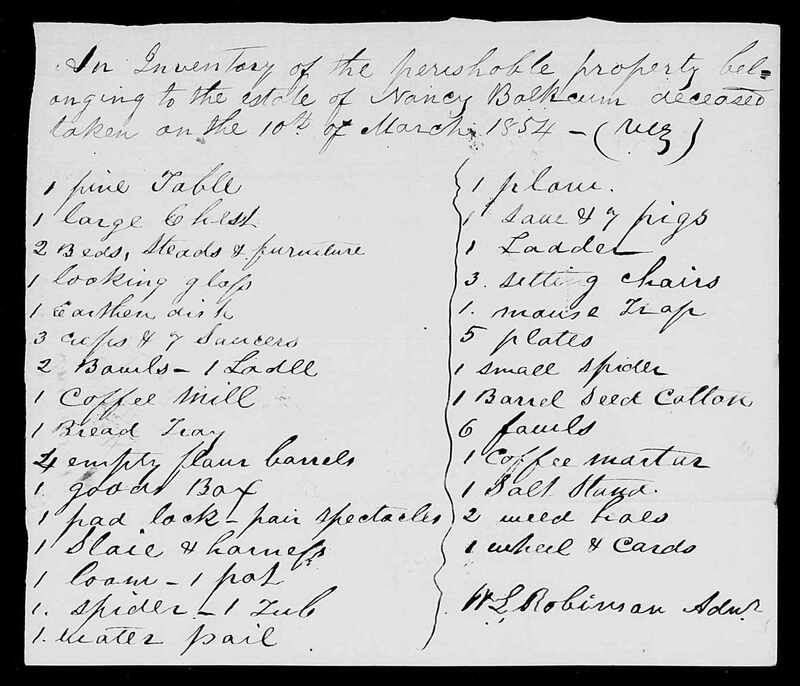 Margaret Balkcum purchased a number of small items from her mother’s estate. 5. Margaret named her second son James Lucian Henderson in 1857. Compare: James Lucien Balkcum, born 1838, son of Nancy Balkcum’s daughter Mariah Balkcum Johnston. 6. Margaret named her first daughter Isabella circa 1860. Compare: Isabella Johnson, born 1858, daughter of Mariah Balkcum Johnson. 7. Margaret named her second daughter Ann Elizabeth circa 1866. Compare: Ann Eliza Balkcum, born circa 1840, daughter of Nancy Balkcum’s son John Balkcum. 8. Margaret named her third daughter Mary Susan circa 1868. 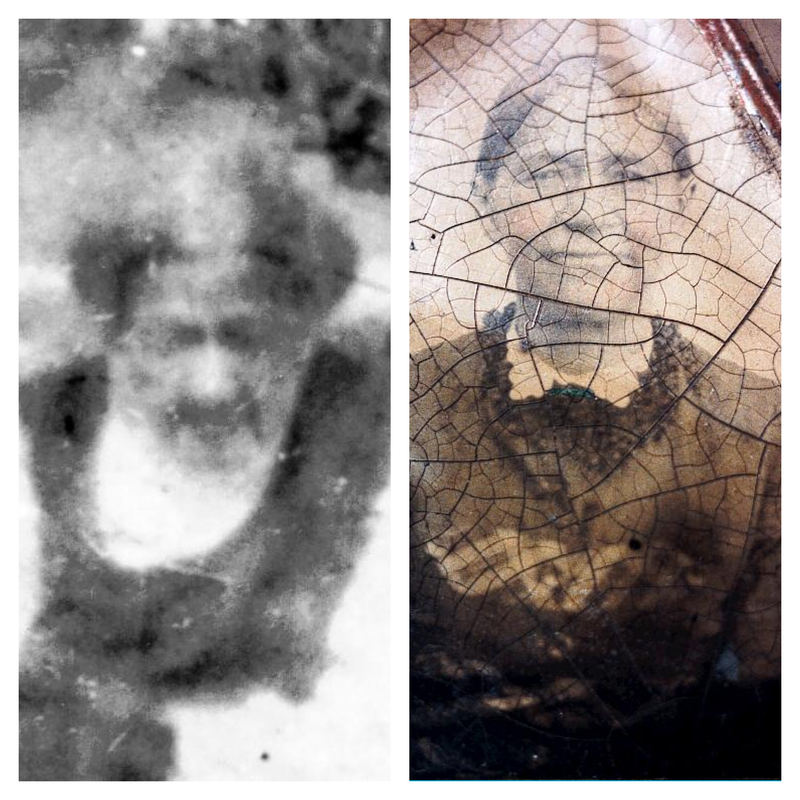 Compare: Mary Susan Balkcum, born 1844 to John Balkcum, and Susan Johnson, born 1844 to Mariah Balkcum Johnson. 9. Between 1860 and 1870, Margaret and her husband Lewis Henderson and Eliza and her husband Robert Aldridge migrated to the Dudley area of southern Wayne County. 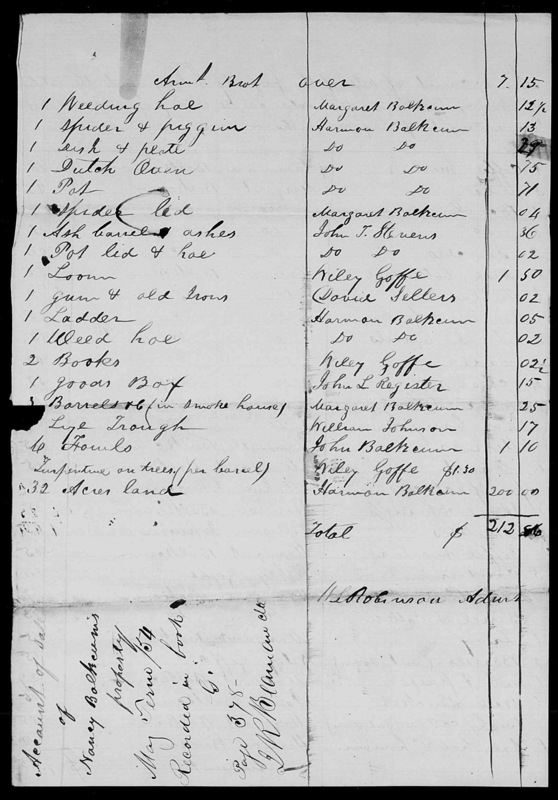 The families are listed side by side in the 1870 census. 10. Caswell C. Henderson’s November 1907 marriage license, issued in New York City, reports his mother’s name as Margaret Balkcum. 11. Matrilineal descendants of Margaret Henderson have mtDNA haplotype H3. Descendants of Mary Eliza Aldridge have mtDNA haplotype H3. 12. Certain descendants of Margaret Henderson share significant autosomal cM totals with descendants of Mary Eliza Aldridge, but have no other known lines of common descent. 2. Margaret’s son Lucian’s June 1934 death certificate lists his mother’s maiden name as Hill. 3. Margaret’s daughter Sarah’s January 1938 death certificate lists her mother’s maiden name as Carter. Informant was Hattie Mae Henderson, Sarah’s great-niece, who told me 60 years later that she did not recall giving this information and did not believe it was correct. 4. Perhaps most puzzlingly, there is absolutely no tradition of kinship between the two families. 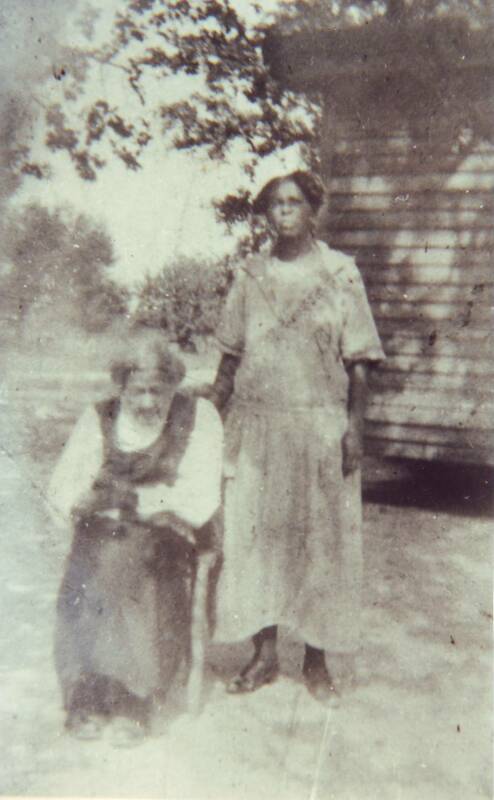 Hattie Mae Henderson was reared by her great-aunt (Lewis and Margaret’s daughter) Sarah Henderson Jacobs. 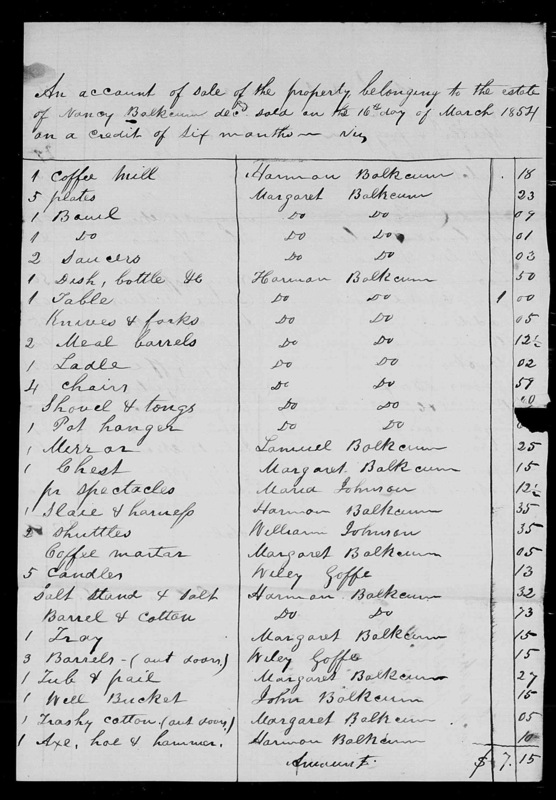 If Sarah had been first cousin to Robert and Eliza Aldridge’s children, it seems that there would have been some acknowledgement of the relationship passed down — not only to Hattie (my grandmother), but to others descended from the free colored families in this small community. They (Simmonses, Winns, Jacobses, Hendersons, Aldridges, etc.) intermarried freely, so consanguinity would not have been shameful. The one exception: Hattie Henderson reported visiting with Sarah a “Cousin Tilithia” in Norfolk as a child. This was Tilithia Brewington King Godbolt Dabney, daughter of Robert and Eliza’s daughter Amelia Aldridge Brewington. 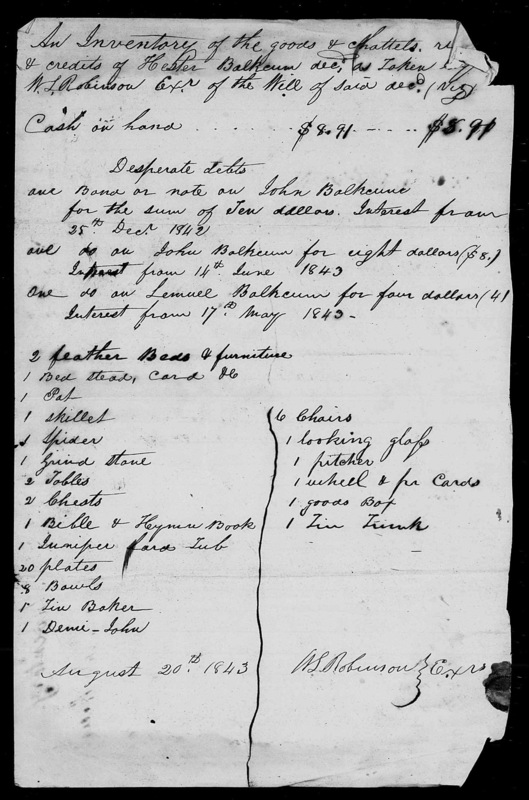 Did Sarah call Tilithia “cousin” because they themselves were related, or because Hattie was related to Tilithia (through J. Thomas Aldridge, her father and Tilithia’s first cousin)? A point to consider: all but one of Lewis and Margaret’s children (son Lucian, who himself had no children who lived to adulthood) had died or migrated from Dudley by about 1905. The “lack of tradition” I perceive may simply be a function of a gap in familiarity between those people who knew Lewis and Mag’s family and those I was able to interview 80-90 years later. Photo of Margaret Henderson in collection of Lisa Y. Henderson.